As part of the Black Friday Sale, Flipkart and Xiaomi are offering a mouth-watering launch day offer on Redmi Note 6 Pro in India. 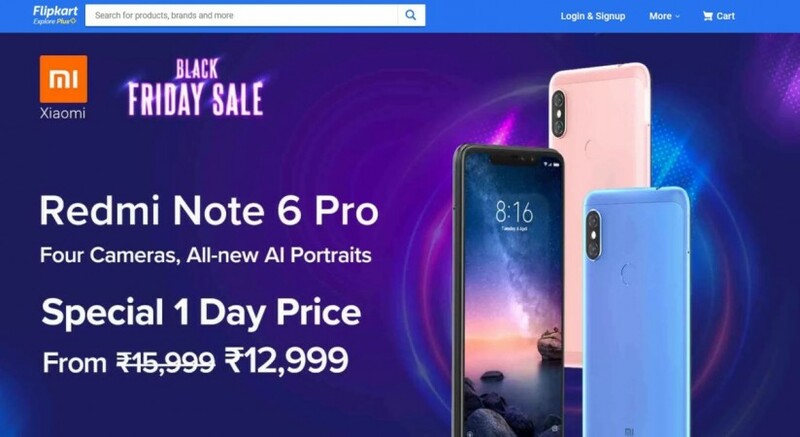 After the success of Dussehra and Diwali promotional campaigns, Flipkart and Xiaomi have taken a shine to the western post-Thanksgiving shopping festive season and is now hosting the Black Friday Sale, but particularly for one phone —Xiaomi Redmi Note 6 Pro. Flipkart in collaboration with Xiaomi and HDFC Bank is giving away the recently launched Redmi Note 6 Pro variants for an unbelievable price for just one day (November 23). The company will be offering Rs 1,000 flat discount on — 4GB RAM+64GB storage and 6GB RAM+64GB storage —models. They can now be bought for Rs 12,999 and Rs 14,999 against the MRP Rs 13,999 and Rs 15,999, respectively. If you happen to have HDFC bank card, they can claim extra Rs 500 cash back, further reducing the prices to Rs 12,499 and Rs 14,499, respectively. Add to that, Reliance Jio subscribers who buy Redmi Note 6 Pro will get Rs 2,500 discount, which can be redeemed with Rs 50 vouchers each time they recharge the phone with unlimited plans starting at Rs 399. Besides Flipkart, Xiaomi will also be offering a similar deal on the Redmi Note 6 Pro on Mi store and Mi Home. The sale will go live later today at 12:00 pm. There is no official word on how many units, but company sources have confirmed International Business Times India that it has shipped truckloads of stock to the Flipkart's warehouse earlier this week. Rest assured, there won't be any repeat of Xiaomi UK's flash sale with low stocks, which caused a public backlash in Europe. Considering the specifications, this is the best deal you can get for feature-rich Redmi Note 6 Pro. This kind of discount offer is usually given during the lag-end of the product life-cycle, but Xiaomi and Flipkart want to return the favour to loyal patrons who always pay high in the early launch period and feel disappointed when the company slash prices few months after the launch. For those unaware, the new Redmi Note 6 Pro is a photography-centric phone. It comes with four cameras, two each on the front and the back. On the rear side, it comes with an equally impressive AI-backed 12MP sensor with dual pixel autofocus, 1.4µm pixel size, F1.9 aperture, Phase Detection Auto Focus) and a 5MP depth sensor with Artificial Intelligence (AI) Scene Recognition, EIS (Electronic Image Stabilisation). On the front, it houses an equally impressive dual-camera – primary 20MP sensor with 1.8µm pixel size, F2.0 aperture and a secondary 2MP depth sensor. It supports Artificial Intelligence (AI)-powered Portrait 2.0, Beautify 4.0 and Face unlock feature. Other stipulated features include 6.26-inch screen with 2.5D curved glass, Qualcomm Snapdragon 636 octa-core processor, Adreno 509, Android Oreo-based MIUI 10, 4GB RAM, 64GB storage (expandable) and a 4,000mAh battery, which is more than enough to keep the phone running for one and half day respectively. Stay tuned. Follow us @IBTimesIN_Tech on Twitter and on Google News for the latest updates on Xiaomi products.